BP PRODECK is a synthetic roofing underlayment made from a waterproof construction of woven polypropylene and a non-woven topcoat, specially designed to reduce slipperiness. It protects roofs even in the most extreme weather conditions, offers high resistance to tear, and can be left exposed for up to a month. It is backed by a 15-year warranty. BP PRODECK membranes can be installed under all types of sloped roofing material: asphalt shingles, metal roofing, wood shakes, synthetic or slate tiles. 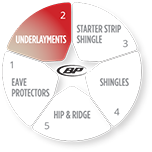 They are lined every 2 inches for easy installation of BP architectural shingles.